A family passes through Maktab Khaled in northern Iraq, the last Kurdish checkpoint before they make their way to Kirkuk. ISIS-controlled territory lies less than a mile away. Vendors sell cooking gas to people passing in and out of the checkpoint. The disputed area around Maktab Khaled is one of the last passageways where civilians can travel between the relative safety of the Kurdish north and the one-third of Iraq that ISIS controls. Sandbags, concertina wire and armed Kurdish forces man a series of checkpoints at a crossroads between them and ISIS less than a mile away. It's the same country but feels like an international border crossing — a border that divides families, lives and livelihoods. It used to be an Iraqi army checkpoint before the Iraqi forces fled this summer in the face of ISIS advances. Then the Kurds swooped into the disputed territory. Relics of the Iraqi army are still here. There are four Humvees and several armored vehicles. One is spray-painted with the words "Loyalty to Iraq" — ironic given that extremists from ISIS have wrested control of about one-third of the now-fractured country. This contested military zone is one of the last where civilians flee to try to get to the relative safety of the Kurdish north, or to return back to their families in ISIS-controlled territory. Families carry babies and bags to walk through the dusty terrain from one world to the other. Those bags are searched multiple times before the travelers board buses or walk from one end to the other. On the Kurdish-controlled side, the buses are driven by Kurds; on the other, Arabs. Civilians, mostly Arab, stream through searching for safety, education or cheaper goods. On the Kurdish side of the checkpoint, in the ethnically mixed city of Kirkuk, women don't cover their faces. But they carry the black shroud, or have it swept up on their heads, ready to wear as soon as they reach ISIS territory. There they must comply with the stringent laws of the extremists who are in control. About 5,000 people cross this artificial border every day, a testament to the civilians caught in the middle of this fight and just trying to survive. Some are escaping airstrikes or the brutality of the ISIS gunmen. Vendors are capitalizing on the misery. Taxis wait, calling out destinations for recent arrivals. A cigarette stand is set up to serve those who have just arrived on the Kurdish side, coming from Islamic State territory. Under ISIS, smoking is forbidden. Men sell cooking gas cylinders for about $8. They are triple the price in ISIS-controlled areas. Hasna Hussein carries her 2-year-old and two bags, herding her four other children on foot through the checkpoint. She is trying to get to her village, which lies on the ISIS side. "It's like two countries," she says. "I cry every time I cross. Iraq is broken." She comes to Kirkuk for paperwork in the province nearly every day. But the journey is long. She's forced to walk nearly an hour, carrying children and her belongings. On the Kurdish side, they regard her with suspicion and search her bags. On the ISIS side, she cowers in her house, away from the gunmen in the streets. "We want a solution," she says. This place is a window into life under ISIS and how people are shouldering the burden of this new reality. On this day, college students are streaming through. Uday Abdullah carries pillows in a plastic bag. He used the pillows to hide his books and his ID. It's where he stuffed them when he sneaked out of the ISIS-controlled city of Mosul at 4 a.m. to get to his exams in Kirkuk. He hid his books because the head of the Islamic State, Abu Bakr al-Baghdadi, decreed it illegal to attend state universities. "They won't allow us to continue our studies," Abdullah says. His friend, too afraid to give his name, chimes in. "We are the living dead in Mosul," he says. "No electricity, no water, no jobs, no education and death in the streets." Nearby, a man and his two sisters and their children wait for their bags to be searched. He's here to say goodbye to them. The family is divided. Ahmed Mohamed's two sisters live in Mosul and he lives in Kirkuk. After their bags are searched, they walk to the buses just beyond the sand-filled barriers at the checkpoint. They kiss each other goodbye and ask God for mercy. The two sisters and the children board the bus; just beyond a stretch of asphalt is no man's land. There the family will walk into ISIS territory and continue their journey. But unlike these two sisters, going back to ISIS-controlled areas isn't a choice for everyone. Some of those seeking refuge in the Kurdish north or the disputed territories have run out of money and have to go back. They don't know what awaits them on the other side. Now to Iraq, where the Islamic State, or ISIS, controls about a third of the country. The rest is controlled by Kurdish forces in the north and Iraq's army and Shiite militias in the south. NPR's Leila Fadel recently visited one of the last checkpoints where civilians can stream back and forth between ISIS territory and the relative safety of the Kurdish-controlled north. She sent this report. UNIDENTIFIED MAN #1: That's the river. That bridge. You see there? Down the bridge there are checkpoint of ISIS. LEILA FADEL, BYLINE: We're at a checkpoint called Maktab Khaled and that's a Kurdish soldier describing an ISIS checkpoint less than a mile away. Under the bridge are the black flags of the so-called Islamic State. We're about 12 miles south of the disputed and oil-rich city of Kirkuk. Sandbags, concertina wire and armed Kurdish forces man a series of checkpoints at a crossroads between them and ISIS. It's the same country but it feels like an international border crossing. This used to be an Iraqi army checkpoint before they fled ISIS advances. Then the Kurds is swooped in. 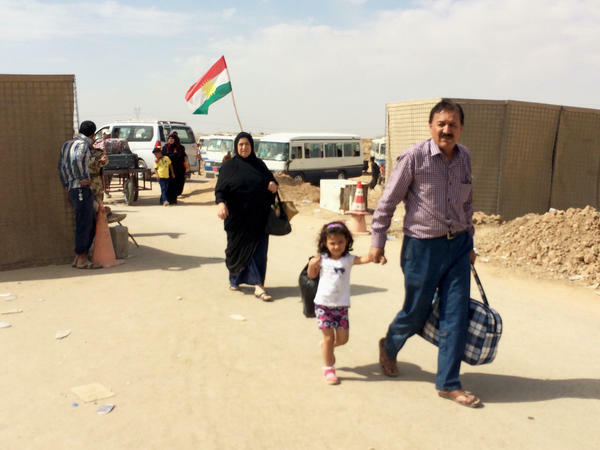 Now civilians use this contested military zone to flee to the relative safety of the Kurdish north, or to return back to their families in ISIS-controlled territory. Families carry babies and bags to walk to the dusty terrain from one world to the next. Those bags are searched multiple times before they board buses or walk from one end to the other. On one side, the buses are driven by Kurds, on the other, Arabs. 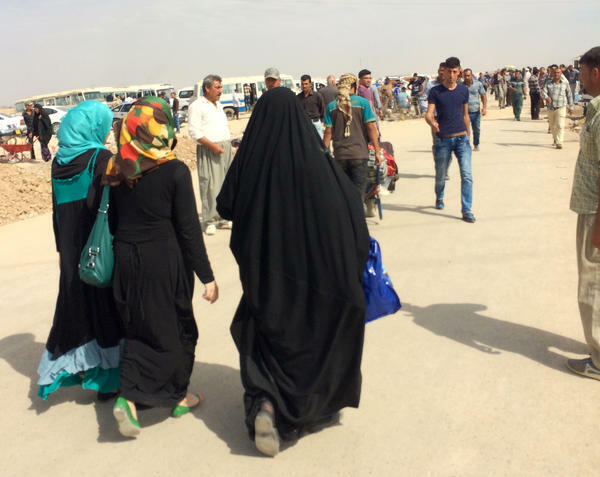 In this ethnically-mixed city of Kirkuk, women don't cover their faces but they carry the black shroud or have it swept up on their heads, ready to wear as soon as they reach ISIS territory because there they must comply with the stringent laws of the extremists in control. About 5,000 people cross this artificial border every day. It showcases the civilians caught in the middle of this fight. It divides families, lives and livelihoods. Some are escaping airstrikes or the brutality of the ISIS gunmen and some are just looking for cheaper gas and food in the Kurdish north. Vendors are capitalizing on misery. Taxis wait, calling out destinations for recent arrivals. A cigarette stand is set up to serve those who just left ISIS territory. Under ISIS, smoking is forbidden. 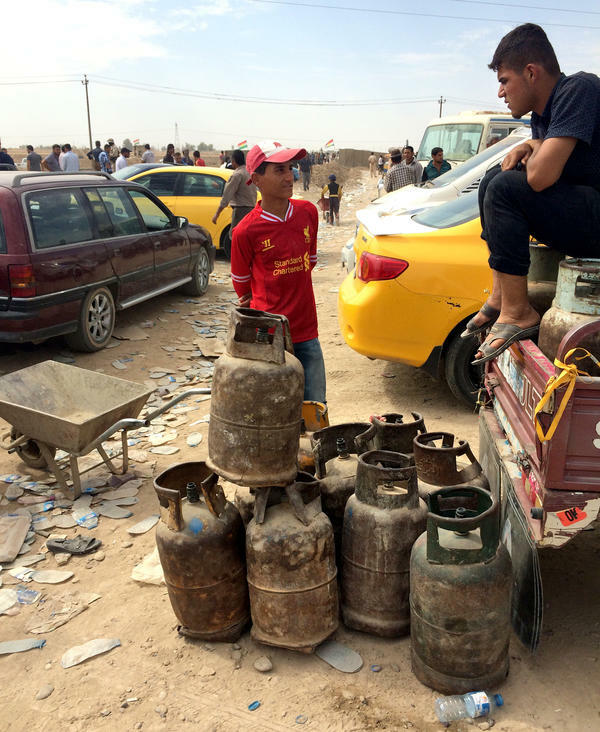 Vendors sell cooking gas cylinders for about $8. It's triple the price in ISIS-controlled areas. HASNA HUSSEIN: (Foreign language spoken). FADEL: Hasna Hussein carries her 2-year-old, two bags and herds her four other children on foot through the checkpoint. She's trying to get to her village that lies on the ISIS side. FADEL: It's like two countries, she says, I cry every time I cross. Iraq is broken. This checkpoint is a window into life under ISIS and how people are shouldering the burden of this new reality. On this day, college students are streaming through. FADEL: Take Uday Abdullah - he's carrying pillows in a plastic bag stuffed with books and his ID. It's where he hid them when he stuck out of the ISIS-controlled city of Mosul at 4 a.m. to get to his exams in Kirkuk. That's because the head of the so-called Islamic State, Abu Bakr al-Baghdadi, decreed it illegal to attend state universities. UDAY ABDULLAH: (Foreign language spoken). FADEL: He says, they don't allow us to continue our studies. Abdullah's friend compared life in Mosul to the living dead - no electricity, no water, no jobs and death in the streets. FADEL: The family is divided. Ahmed Mohamed's two sisters live in Mosul and he lives in Kirkuk. They kiss each other and ask God for mercy before the two sisters continue their journey. But unlike these two sisters, going back to ISIS-controlled areas isn't a choice for everyone. Some of those seeking refuge in the relative safety of the Kurdish north have run out of money and have to go back. They don't know what awaits them on the other side. Leila Fadel, NPR News. Transcript provided by NPR, Copyright NPR.